Sunset Rock - secluded overlook, great view! The Rhododendron Gardens - pretty any time of year, but especially in June. Directions: Take Route 19E to the town of Roan Mountain, turn onto Route 143 and travel 12.8 miles to the TN/NC state line (Carver's Gap). On your way up the mountain, you'll pass by the Dave Miller Homestead and the Roan Mountain State Park. Eventually, you leave the state park and enter the national forest. At Carver's Gap turn right, following the signs to the Cloudland Hotel site and Rhododendron Gardens two miles up! After checking out the Cloudland site, Sunset Rock and the Rhododendron Gardens, drive on to the end of the gravel parking area and park at the trail head for the Roan High Bluff -- a short hike (1/2 mile) will take you to the overlook. After that, return to Carver's Gap on your way down from the gardens and take the Appalachian Trail to the top of Round Bald -- this short hike will give you an amazing panoramic views of the mountains, a short distance further on the AT will take you to Jane Bald. If you continue on, you'll reach Grassy Bald. 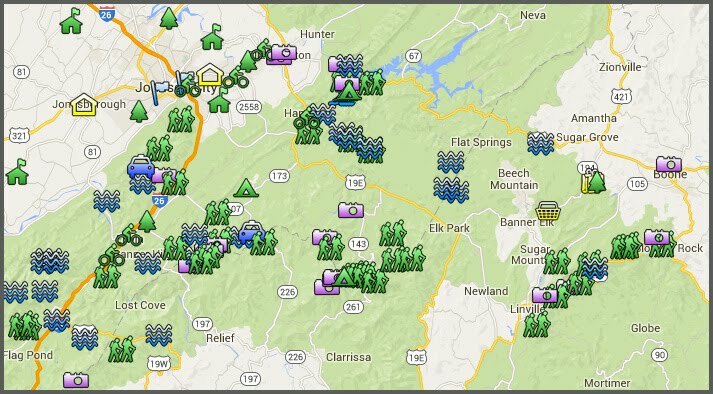 Click here for information about hiking the AT through the Roan Highlands; click here for a topo map of Roan Mountain. One Christmas eve (probably in the late 1970s or early 1980s) my family left my grandparents house in Mitchell county to go up on the Roan and hike out to the overlook. It was a bright crisp night and when we got there the view was spectacular. The sky was filled with stars and the lights of the cities and towns in Tennessee provided a nice contrast. Sadly, the park is apparently closed now during the winter, so anyone wishing to see such a sight for themselves would have a long hike, but the memory stands out clearly in my mind even after all these years.